If you can’t sleep it’s because you’re awake in someone else’s dream. That’s nice to know. I’m currently being stalked by a DNA binding protein named PAX6 that has an affinity for the H3K4me1 DNA element – which resides next to the polymorphic sites rs11208305 (chromosome 1p31) and rs718712 (chromosome 20p12) – who, themselves, are involved in the regulation of the expression of the ROR1 and PLCB1 genes, respectively. 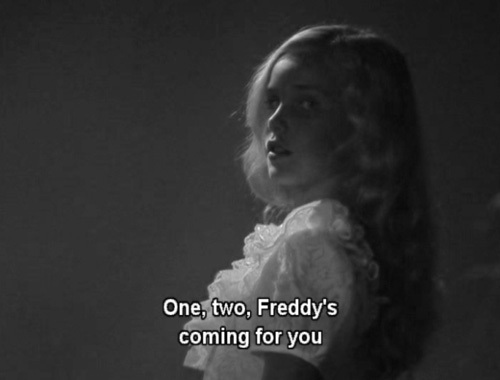 Yeah, Freddy is sneaky like that. These 2 SNPs were the most highly associated low-hanging fruits of a large genome association study of insomnia. Interestingly, PAX6 is expressed both in the brain and in the pancreas (insomniacs often have high insulin levels at night). The authors thus explored the notion that the expression of ROR1 and PLCB1 might be regulated by PAX6 both in the brain (where it can influence neural and circadian functions) AND in also the pancreas (where it can influence insulin secretion). Caveat: The authors report a minor allele frequency of 0.03353 for the “C” allele at rs11208305. Such rare alleles can vary in frequency dramatically across populations and lead to false positive results in case-control analyses.